As one of the biggest telecommunications company in the country, Smart started to fire up their first 3 long term evolution (LTE) cell sites with 700 MHz that was acquired from San Miguel Corporation (SMC) that was located at Tanay, Rizal, ; Manggahan Area at Pasig City; and Matina, Davao, City. It is their way of improving their internet service for their valued customers. It was also after the National Telecommunications Commission (NTC) approved Smart to increase their frequencies. On a facebook post by Smart’s external relations team, they had a record at Rizal with a 222 mbps speed while on the other locations reach 101 mbps download speed. 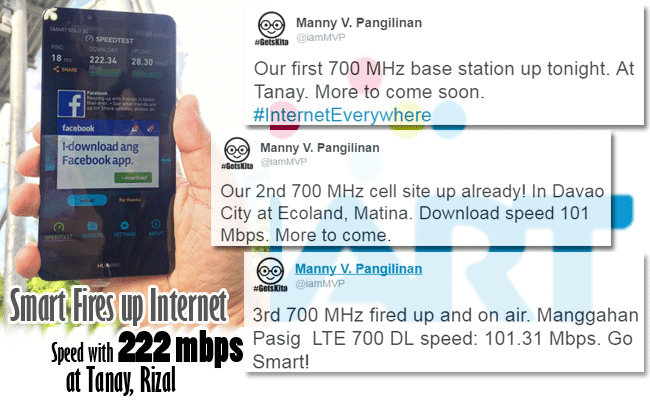 Manny V. Pangilinan, chairman of Smart’s parent company Philippine Long Distance Telephone Company (PLDT), first posted on his twitter account last June 7 the locations of the 3 cell sites. Joachim Horn who is the Information Advisor and Chief Technology of PLDT and Smart released a statement that the new found technology will be a big help to a huge increase of LTE’s and faster mobile data. Aside from Smart, their competitor Globe Telecoms also used the 700 MHz spectrum. Their first cell site was located at UP Diliman, Quezon City. Senior Vice-President for Globe Joel Agustin revealed on his interview that they are first concentrating on National Capital Region (NCR) that has a huge amount of customers by putting first 200 cell sites. He added that mobile users who are not compatible with LTE’s can benefit from it because other users will use different frequencies. PLDT on the other hand said that they will put 360,700 sites throughout Manila, Cebu, and Davao. With these new developments from 2 of the country’s largest telecommunications, many subscribers from Globe and Smart were ecstatic that finally the internet speed in our country will get faster.